John Sterman has a reputation. The MIT Sloan system dynamics professor is sometimes referred to as Dr. Doom when he demonstrates how our health and prosperity are threatened by climate change and other environmental problems. So it’s a change to find him somewhat hopeful. “We can do it. But we’ve got to be more aggressive,” he says about slowing global warming, as he demonstrates the C-ROADS climate change computer simulation he has developed over more than two decades with the nonprofit Climate Interactive. It won’t be easy. Having a good chance at limiting warming to 2 degrees Celsius (3.6 F), a limit agreed upon in 2010 to avoid the most dangerous effects of climate change, will require big changes on multiple fronts: a meaningful price on carbon pollution, greater efficiency in end use, faster growth of renewables, reductions in deforestation, and improvements in land use, among others. And we have to begin immediately, Sterman says. But we aren’t over the cliff just yet. On Nov. 30 negotiators from governments around the world will arrive in Paris to attempt an agreement to limit global warming to that 2 C (3.6 F) level. 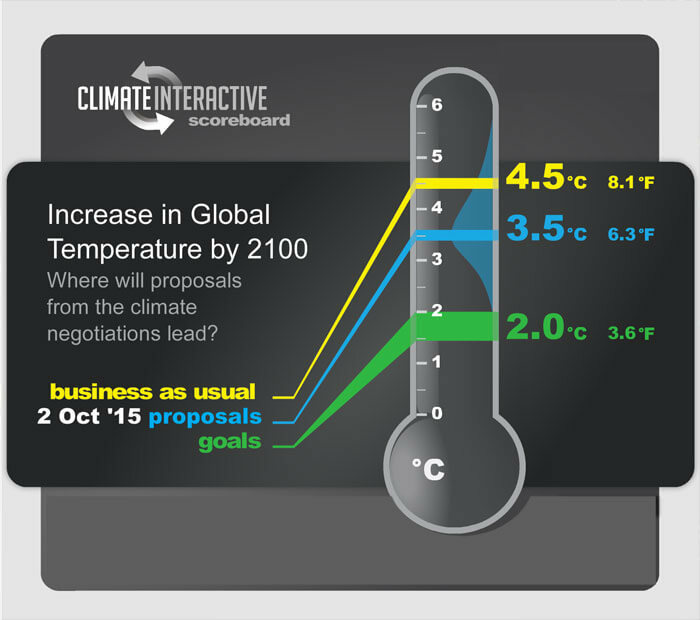 To help negotiators at the 12-day United Nations Climate Change Conference keep their eyes on the prize, Sterman and Climate Interactive have developed a live “ climate scoreboard” that uses C-ROADS to show the expected increase in global temperature based on the latest commitments from the negotiation. In advance of the conference, people around the world are using C-ROADS to run mock negotiations. More than 150 events have been held with more than 7,300 participants in 41 countries, from Argentina to Zimbabwe. 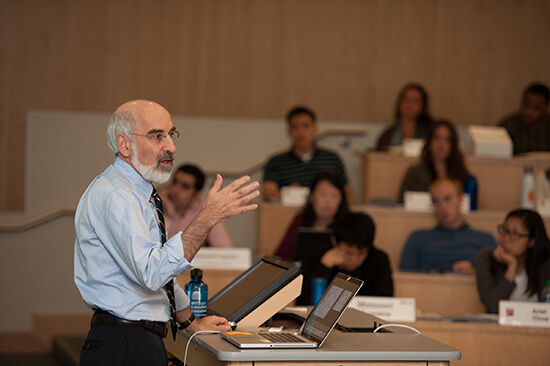 Sterman—who has led mock negotiations in MIT Sloan classes, with executive education groups, and in workshops for policymaker delegations from China—says the events enable people to learn for themselves about the complexity of the science and politics of climate change and the urgent need for action in Paris and beyond. In an interview, Sterman discussed the climate scoreboard, what matters most in the negotiations, and how Climate Interactive is working to build grassroots support for climate change action. What will you be doing in Paris? The science and politics are complex; policymakers and negotiators have a tough time connecting pledges nations offer to implications. So far more than 150 nations have pledged to do something to limit their greenhouse gas emissions. But it is hard to compare the pledges. Some nations pledge to cut emissions X percent below their 2005 level, some Y percent below their 1990 level; some to cut the carbon intensity of their economy [measured as carbon dioxide per dollar of gross domestic product]; some to cut deforestation. This is confusing not only to the media, business leaders, and the public, but to the negotiators. How does it all add up? If all those pledges were fully implemented—a big if—would it be enough to limit warming to 2 C (3.6 F)? We use our model to simulate the likely impact of all the pledges through the year 2100. Is it realistic to think the negotiations will result in a pathway to 2 C (3.6 F)? We’re not trying to predict. We are posing “What if” questions. What if all the pledges made to date are fully implemented, but there’s no further ambition? By 2100 we’d have 3.5 C of warming (6.3 F, with a range of uncertainty from 3.6 to 8.2 F). That’s real progress: it’s about 1 C (1.8 F) less than business as usual, but still far too high. We need deeper, steeper, and earlier reductions in global greenhouse gas emissions. Why? It’s a matter of basic physics: Today we are spewing CO­2 and other greenhouse gases into the atmosphere more than twice as fast as they are being removed. If you fill your bathtub twice as fast as water drains out, the level of water in the tub will rise until it overflows and ruins your house. The pledges to date slow the growth of emissions. But large cuts are needed to balance the tub—to stop the growth of greenhouse gas concentrations in the atmosphere. We use our simulation to ask “what if” questions: What if India were to make a deeper commitment? What if China cuts its emissions after 2030? What if the U.S. and other developed nations make deeper cuts? These “ ratchet scenarios” show the magnitude of the work ahead for negotiators, policymakers, businesses—all of us. What do you expect to see happen in Paris? I’d rather focus on what’s needed, not erode our ambition by reinforcing what is expected. We need stronger Intended Nationally Determined Contributions, policies to make good on those commitments, and enforcement mechanisms to ensure they are implemented. But that’s not enough. Global emissions cannot fall enough to limit warming unless the developing nations also reduce their emissions. That does not mean that the poorest nations must sacrifice their development to do it. The developed countries should cover the cost of emissions reductions in the developing world so these nations can leapfrog the polluting fossil fuel infrastructure through clean, renewable energy and efficient end use, just as Africa jumped straight to mobile telephony, leapfrogging land lines. It’s in everyone’s interests to do so. The developing nations will suffer the most from climate change, yet have the least ability to respond. The developed nations also have vital interests here. Look at today’s refugee crisis. Imagine the consequences of delay, as sea level rises, crops fail, conflict spreads, and tens of millions of climate refugees stream into America, Europe, and other countries. Imagine a perfect agreement comes out of Paris. What happens when it arrives in Washington, New Delhi, Jakarta, Mexico City, Abuja? Dead on arrival, because there isn’t enough grassroots public support for action today. There aren’t enough votes to cut existing fossil fuel subsidies, put a price on carbon, invest in efficiency and renewables, stop deforestation. Science is no longer the bottleneck. The challenge is political and social. Years of warnings by scientists have not made climate change the focus of political and social activism. New approaches are needed. Our simulations and role-plays offer one important piece of this puzzle because they give people anywhere in the world the opportunity to learn about these issues for themselves in a non-partisan, non-ideological way. Our simulations run so fast you can grab the mouse and try any experiments you want. And although the assumptions are based on the best available peer-reviewed science, there’s uncertainty. So we don’t compel you to use our assumptions. You can pull a slider, change the parameters and instantly see what difference it makes. Our goals are to support the negotiators and policymakers in their quest for stronger pledges, and make the process more transparent so that businesses, the media, educators, and the public can get involved and build the political will to implement the pledges. Our models are freely available, with all our analysis and data, so don’t take our word for it— try it yourself and get involved.